Lovely newsy post. So sorry to hear you will no longer be hosting but hope to continue seeing your posts anyway. 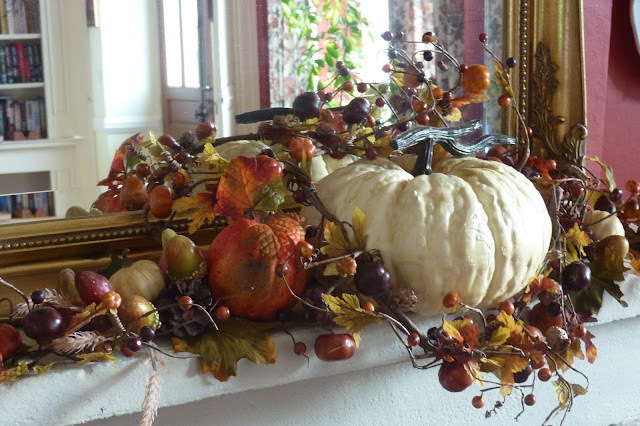 The mantel display is absolutely gorgeous Maggie - and those pumpkins so great. 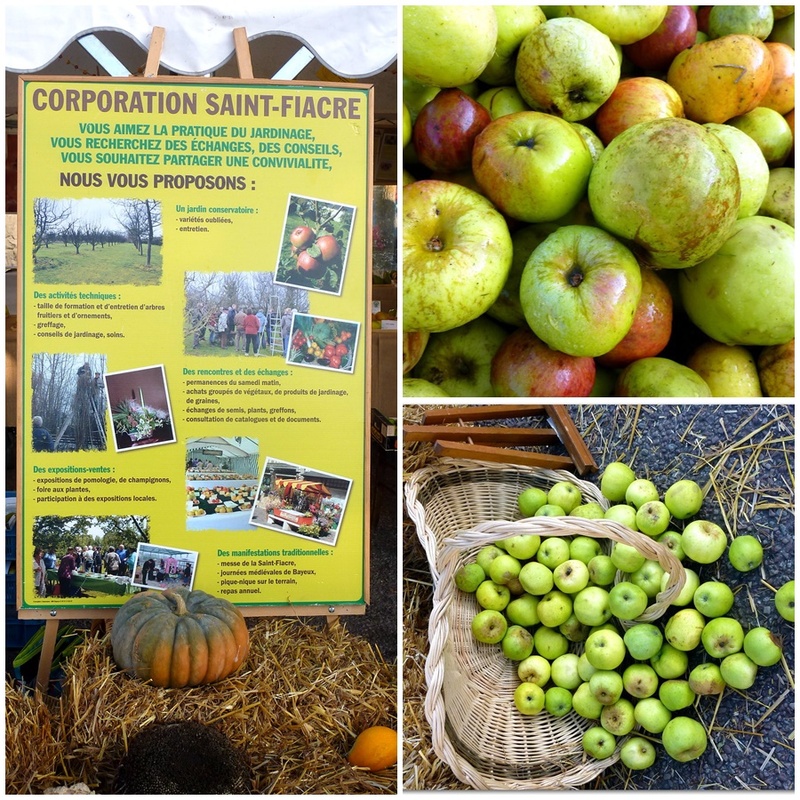 I recall being in France twice for the annual Fete des Pommes - I so enjoyed those celebrations, both in beautiful villages near to where my brother lives. I miss coming over so much but doubt we'll visit again. However, the memories are always with me at this time of year when the vineyards are colorful and the apples ready for picking. Yes, for us, the clocks go back next weekend - where has this year gone? October especially has been very busy here, especially with the big birthday this past week - I'm worn out!!! Happy week ahead - enjoy your Autumn days. Indeed I love such celebrations too... in each time of the year. Your pumpkins are extraordinaire! Thera are funny costumes for Halloween. Wish you a very nice time. Maggie, the photo of you and family is adorable! 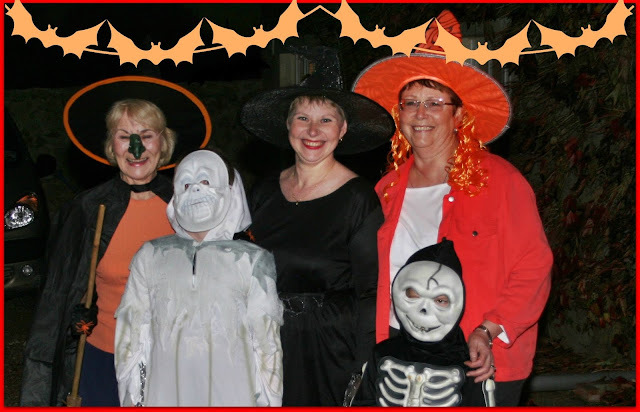 We have fewer and fewer kids come to trick or treat as most in the neighborhood go to one long street that hosts parties. In recent years we just leave our lights off. Sadie is calmer that way because the door bell gets her barking with excitement. Will see about this year. Since it's on a school night, likely few would show up anyway. I may just take a bag of treats to the littles that live close by, so they aren't disappointed. 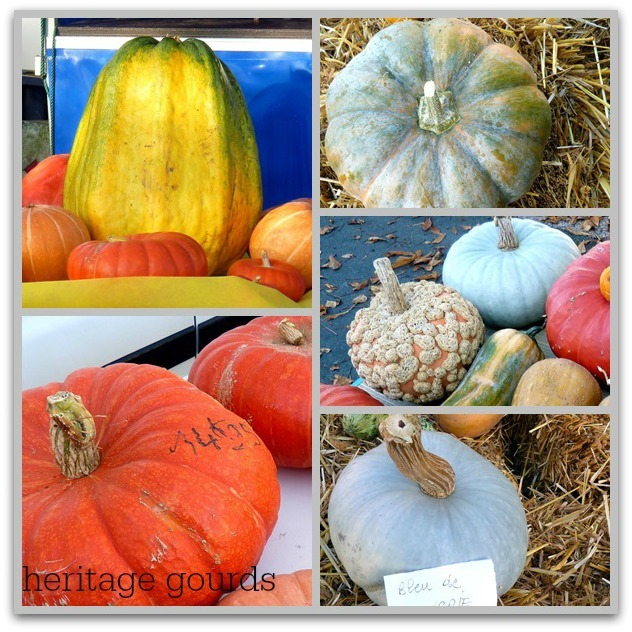 Maggie - it is fascinating to see the different types of pumpkins in France. Here in the US they are pretty uniform in terms of color - but you can select many different sizes and shapes. Later this afternoon we will go and deliver candy to the few kids in our neighborhood - this is our first Halloween in the new house and we have learned that most of the kids are taken down into the closest town so they have more houses to visit. Also, we won't be here on Halloween - we're going to a large Halloween party in Whitefish … I expect you might see some pix on a future post. Thanks for your time hosting MM, and I appreciate all the advice to prepare me for next week! Always love your posts and your sharing of your lives in Normandy. Thanks Maggie for hosting Mosaic Monday. Passing the torch. Do you make soup with those gorgeous pumpkins? The Fete des Pommes sounds like a fun event with the Breton music and dancing. Happy Halloween to you - I'll be passing out treats at our door that night. We are getting more and more little ones in the neighbourhood and it's fun to see them come all dressed up. Thank you, Maggie, for hosting MM. I hope you continue to post on your blog. Gorgeous shots and happy trick or treaters. Happy Halloween, Maggie! I will also be handing out candy at my house. Enjoy all the upcoming festivities. Thank you for hosting Mosaic Monday so well these years! Autumn sounds a treat around your neck of the woods, Maggie. It is a wonderful season, especially with so many great things to do and see. Happy Halloween! Apples freshly picked from the tree are delightful, so the Apple Festival must be a wonderful occasion! Dear Maggie – Happy Halloween to you! I like the way how you enjoy or celebrate your tradition and your mosaic, especially the pumpkin one. I also like Breton music, the sound of bagpipes, accompanied by the dances. Thanks for hosting Mosaic Monday. I could meet wonderful blog friends here. Look forward to seeing you again at Angie’s. PS: Thanks for hosting, Maggie! Maggie, Thanks so much for your time as hostess of Mosaic Monday. Have a great week. I will continue to follow your posts. Sylvia D.